Ned’s Starlite Lounge, run by a dynamic father-son duo, mixes retro digs and comfort food at a vintage spot in north OKC. Ned Shadid Sr. and Ned “Neddie” Shadid Jr. weren’t exactly Bing Crosby and Bob Hope starring in a Road To… movie while they catered for and toured with country music stars, and dreamed of a neighborhood spot … but they were dang close. 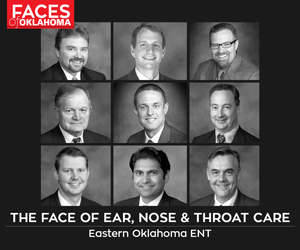 Ned Shadid Sr. has rocked the Oklahoma food scene for decades. From The Brass Apple in El Reno to Ned’s Catering, this man from a close-knit family of entrepreneurs and restauranteurs is a pro in large-scale catering circles and has state and national recognition to back up his (and his son’s) latest adventure, Ned’s Starlite Lounge. Landing the location of the old Nomad’s restaurant on North May Avenue in Oklahoma City made perfect sense for the Shadids’ retro-styled joint and their delicious, unpretentious menu. 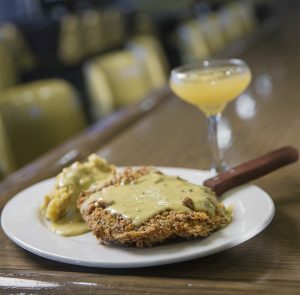 Chicken-fried steak comes with Yukon gold mashed potatoes, slathered in country gravy. It’s paired with the New Aged Meds cocktail with gin, St. Germain, honey and a cannabidiol rinse. The dynamic duo has traveled all over North America with some of the biggest names in country music by feeding the bands and road hands. But one thought in the father’s mind never went away: a local eatery he’d dreamed about for years. Glittery, gold, high-back, tufted corner booths, beside vintage 1970s flocked wallpaper, let you know this lounge comes courtesy of a different era. Smack-dab in the middle of the dining room, a generous bar with spirits, wines and suds is the perfect spot for an after-work happy hour, a New Age Meds cocktail (gin, St. Germain, honey and a cannabidiol rinse), Sunday Funday brunch or a Bloddy Hell (yes, that’s spelled correctly – with Ardberg 10-year-old scotch, Jameson Irish whiskey and bloody mary mix). There’s even a comfy perch to belly up to for late-night snacks and sips with Ned’s Wake and Bake (house vanilla vodka, coffee liqueur and cinnamon). “Dad had this concept in his head for 15 or 20 years, but we’ve been holding out for the right location for the last three,” Ned Jr. says. 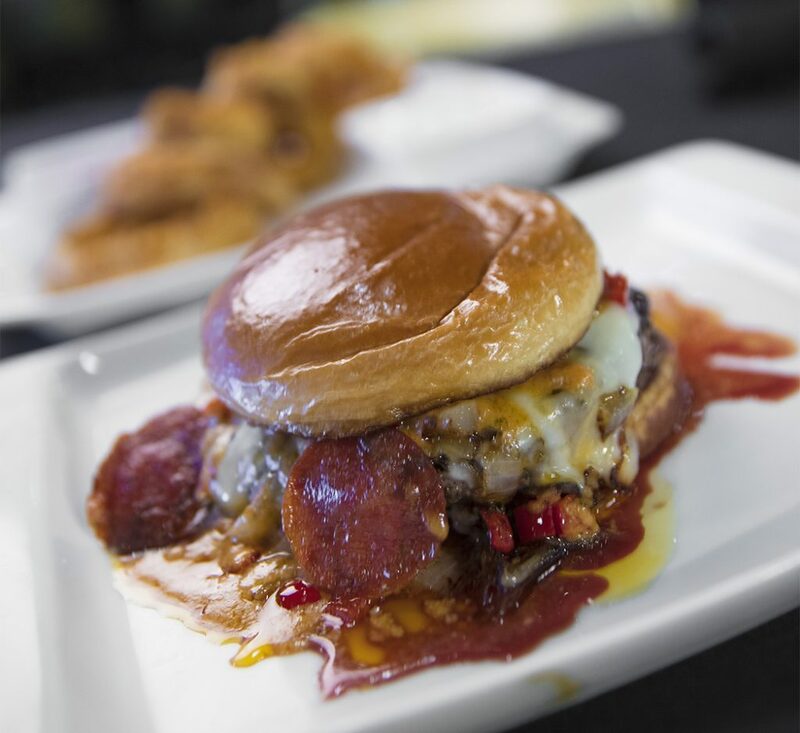 The Nomad Burger comes with sauteed onions and red bell peppers, fried pepperoni, melted mozzarella and roasted garlic tomato reduction. The menu at Ned’s is a bonus trip through some of Oklahoma’s greatest hits, with a respectful nod to the former establishment and a delicious bit of creative Shadid nuance. Six burger choices are a half-pound each, but the Nomad adds all the fixings with fried pepperoni, topped with an amazing roasted garlic-tomato reduction that will have you putting down the fork and knife and licking your fingers. Because no one can chicken-fry a steak like an Oklahoman can, the Shadids hit it out of the park with their house version: thick steak, perfect crust-to-beef ratio, paired with Yukon Gold mashed potatoes under a blanket of cream gravy. 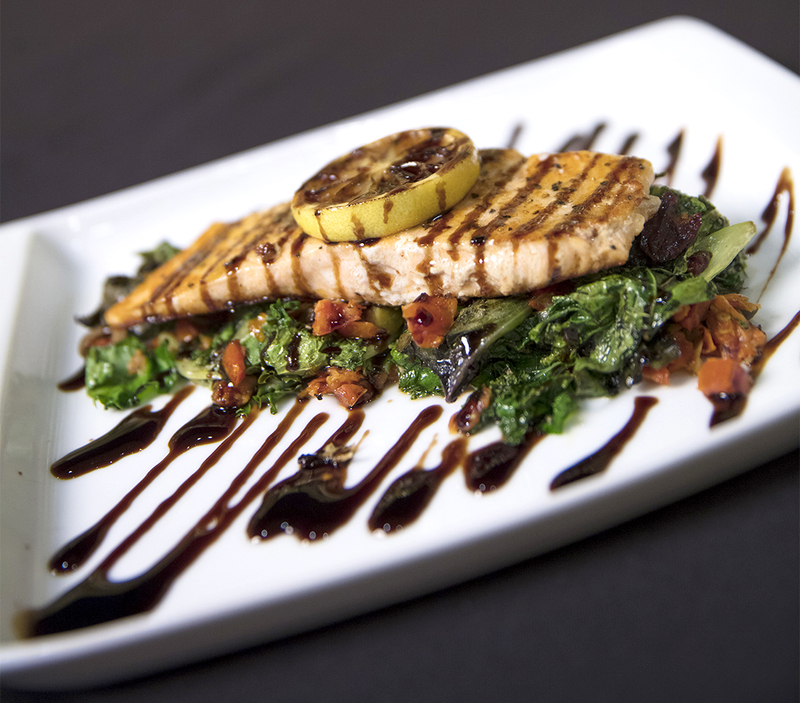 Or you can have grilled salmon over sautéed greens, Southwest chicken and polenta cakes, salads, sandwiches and hummus like only a Shadid can make for a dining experience well met. Check out Ned’s Starlite Lounge the next time you venture to OKC’s north side.